Egg Day - A Holiday for the Birds? A Holiday for the Birds? Can you think of an autumn holiday that doesn't involve pumpkins or pumpkin pie? I’ll give you another clue. It’s celebrated on the second Friday in October. Still can’t think of it? World Egg Day! It’s an international celebration that focuses on the benefits of including eggs in your diet. While this day may not have the importance of some of the major holidays, it seems to me that it is a worthy event, especially when you consider that only a few years ago, eggs were considered the bad guys in the food supply. I can still remember my surprise when health experts first came out with recommendations to severely limit or even avoid eating eggs altogether. The premise was that they contained cholesterol and saturated fat and, since this was during the height of what I like to call the “low-fat diet craze,” eggs were considered taboo. Of course, in recent years, the egg has been somewhat vindicated, but many people still maintain a residual suspicion that keeps them from partaking of this small powerhouse of nutrition. Contrary to all the bad press they have received, eggs are loaded with nutrients such as Vitamin A, Riboflavin, Folic Acid, Vitamin B6, Vitamin B12, Iron, Phosphorus, Calcium, Potassium, Choline and one of the most nearly perfect forms of protein that exists in our food supply. And all that is found in a mere 70-80 calorie, inexpensive and versatile package. What about the cholesterol and saturated fat? There is no question that we in the U.S. eat too much saturated fat. In fact, many of us eat too much fat in general (and sugar, and processed foods, etc. etc. etc. ), but when you consider the various sources of fat in your diet, I would be surprised if eggs are the most significant. While it’s true that eggs contain both cholesterol and saturated fat, they also contain a substance called lecithin, which is a fat emulsifier that helps your body to dissolve the fats in your food and carry it away. When you consider this and the nutrient value of eggs, surely they can be part of a healthy eating lifestyle. How to pick the best eggs? With that thought, here’s a note about the quality of the eggs you are eating. The shell should be thick and not break easily. If it crushes easily, the chicken that it came from was not fed a healthy diet (probably from a chicken factory). Consider buying cage-free eggs or organic eggs. The extra expense is worth it for both taste and quality. (If you buy a cage-free or organic egg and it doesn’t pass the “shell test” or taste better, consider a different brand.) Don’t shy away from brown eggs, they are just from different colored chickens! People on special diets would feel perfectly righteous eating prime rib or bacon, but would cringe at the mere thought of a single egg being included anywhere in their diet. I have personal experience with relatives who would not eat quiche or an omelet, but would scarf down egg-less cheesecake and pork roast with no qualms at all. 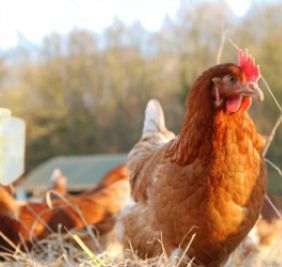 While I’m not suggesting that you send Egg Day greeting cards or put up Egg Day decorations, why not celebrate Egg Day by educating yourself about the value of including good quality eggs as part of a healthy diet. Click here to go from Egg Day page to Raw Eggs page.